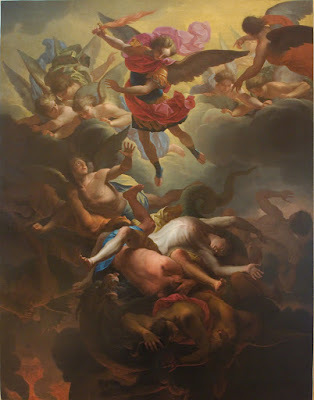 Using any prayer that you may prefer during the novena, let us pray the most powerful celestial protector, SAINT MICHAEL THE ARCHANGEL, for special protection against the diabolical forces of pure evil attacking our Holy Mother the Church in the weeks and months ahead. The Church truly needs it. The novena goes from September 20 to September 29 (or September 19 to September 28, for those who prefer to end it on the eve of the feast), and a prayer suggestion is of course the long original version of the abbreviated version proposed by Pope Leo XIII and said after each Low Traditional Mass.